Using the MAC 249 firm, flat shadow brush, pick up a small amount of Indian wood paint pot – the amount of product shown on the brush is all you need for each eye. 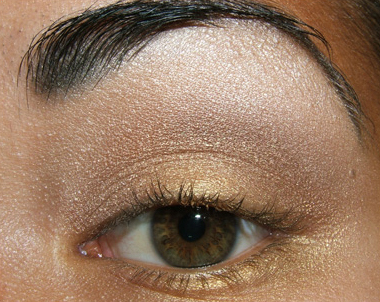 Apply the color on the inner portion of your lid. Cover your entire lid and just above your crease . 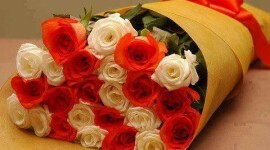 It should be smooth and fairly even, but it does not need to be perfect. 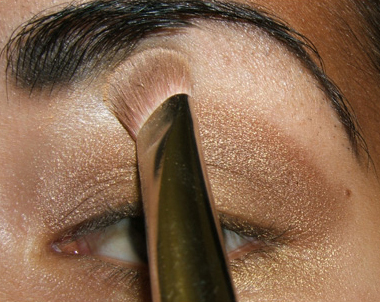 Using the 239 brush, apply Grain eyeshadow to the inner lid. 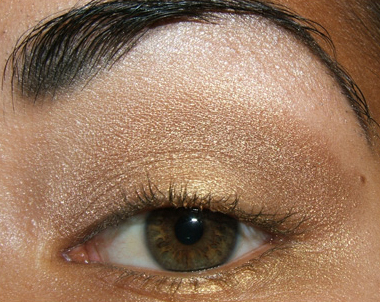 Pick up a generous amount of Gold bronze eyeshadow with the 239 and apply to the middle of the lid. 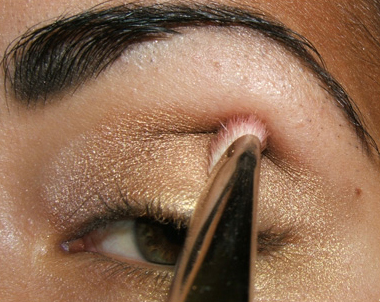 Bring the brush downwards to cover the entire middle portion of the lid. 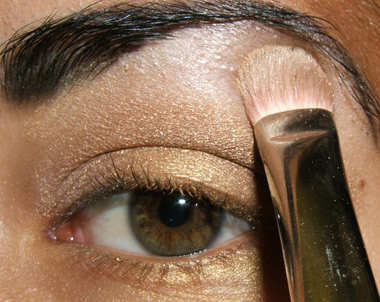 With the 239 brush, pick up some Golden eyeshadow and apply it to the outer third of your lid. 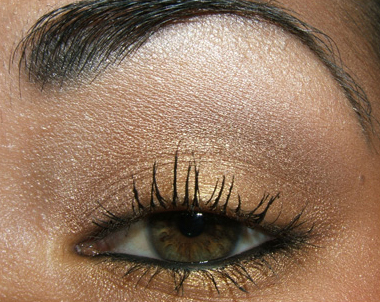 As always, bring the color from just around the crease area downwards to the lash line. 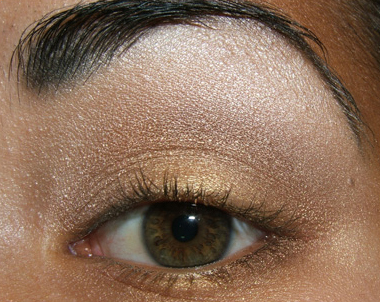 This is why this is called an easy neutral eye, because we haven’t even started to blend! 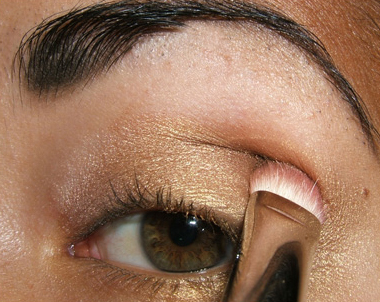 Repeat the step before, only this time place the Golden eyeshadow in the very outer portion of your crease. Move the 239 sideways towards the outermost portion, just to darken slightly. With the 239, pick up a very small amount of Carbon eyeshadow and move your brush to the outer half of your crease and sweep outwards. By sweeping outwards you will deposit the black shadow in the portion you want. It should be a very obvious black line, almost, because it has not been blended, only applied. Using the same method as used to apply the black shadow, use this method, only with less pressure, to sweep back and forth across the area with the black shadow to help blend it into the other lid colors. When meshed with the other colors, the black becomes a smokey brown color and less drastic and harsh. 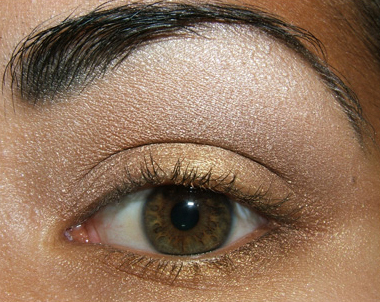 With the 239, pick up a generous amount of Grain eyeshadow and begin applying it beneath the inner portion of your eyebrow. 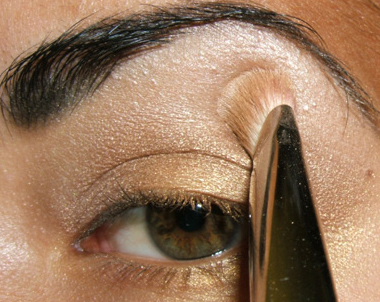 Use a sweeping motion towards the outer edge of your eyebrow as pictured. This is what you should find yourself seeing. Continue to apply (and pick up more shadow if necessary) the highlight color directly below the first sweep of color and above the crease to help mesh the colors together. This is how all the highlight should be looking at this point. 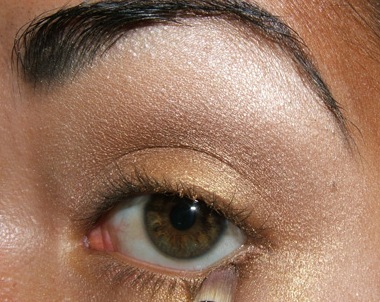 You can add more if you feel you need it (pictured here, more could be applied closer to the inner lid, directly below the inner brow) or less by dabbing the area with your fingertip (gently!). 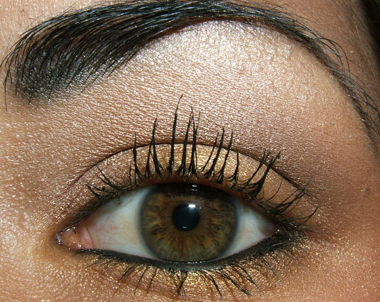 Using the 219, apply Bronze eyeshadow along the outer lower lash line. 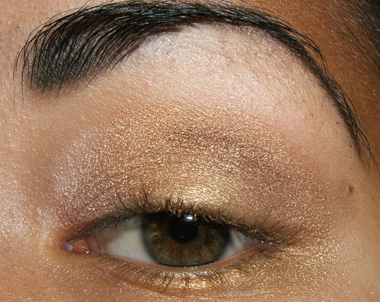 Again, using the 219, apply some Goldmine eyeshadow to the inner half of the lower lash line. 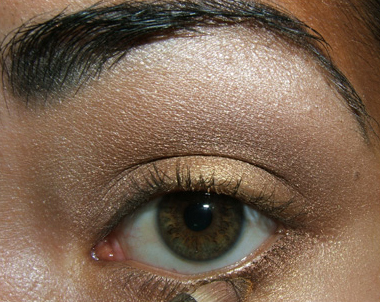 Your lash line should look something like this. Apply Graphblack technakohl or your choice in black eyeliner to the lower lash line, keeping clear of the water line. 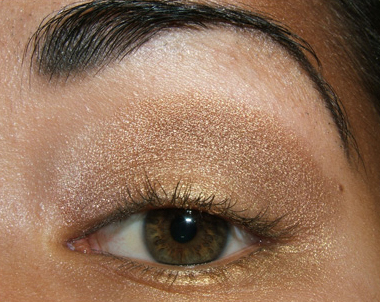 Your now done with the Bronze eye that can be worn throughout the day, and for any occasion.